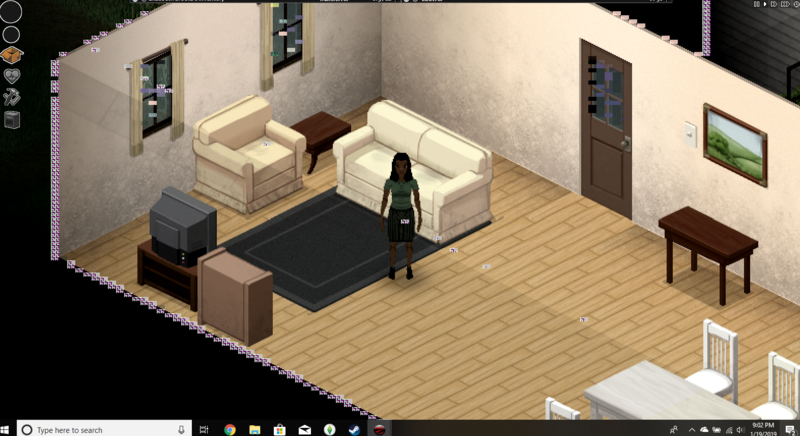 So I disabled all of my mods and I'm still having trouble with this visual glitch on the linings of walls. I have no idea what could be causing it but it is so frustrating trying to play with this. Anyone have a similar experience or a solution?? Did it happen before enabling any mods? @Beard I tried that, disabling all mods, uninstalling and reinstalling, and logging onto my boyfriends Steam account on the same computer. The problem persisted. I logged onto a friends computer on my account and we didn’t have any problems so it’s gotta be my computer. I tried running PZ in compatibility mode and that got rid of the visual problem but doesn’t allow me to zoom? So I’m at a loss for what it could be I also ran a comprehensive Norton scan on my computer and nothing came up. Anything?? Select compatibility mode from the start options. Does the problem go away?